Thanks to a breakthrough surgical technology, there is a new category of minimally invasive surgery for which you may be a candidate. It is an effective, minimally invasive alternative to both open surgery and laparoscopy. Through the use of the da Vinci surgical System, surgeons are now able to offer a minimally invasive option for complex surgical procedures. Imagine major gynecological surgery performed through the smallest of incisions. Learn more about this advanced procedure provides an alternative for special conditions and more importantly, read what da Vinci means to patients. 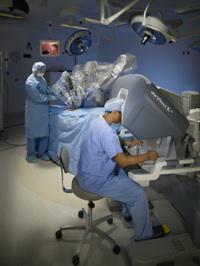 We are considered Southeastern Michigan’s leading experts in minimally invasive surgery. We routinely utilize cutting edge equipment for patient care, but we’re more than just surgeons. We’re teaching other Michigan doctors and we’re sharing our knowledge of this exceptional medical breakthrough. We instruct other attending and resident physicians on the use of the da Vinci Surgical System and the minimally invasive surgical procedures it supports. Want to learn more? Watch Dr. Corsi perform surgery with the da Vinci Surgical System in his interview with Lila Lazarus.